Research has found that liquids released from fracked oil and gas wells can harm fish even at low concentrations. "When we put these frack fluids in, the fluids themselves generate chemicals that have detrimental biological effects," said University of Alberta biologist Greg Goss. It's long been known that chemicals used in fracking — which uses fluids under high pressure to fracture rock formations and release oil and gas — are environmentally toxic. Goss and his colleagues conducted a study intended to consider how toxic they are by using water that flowed from an actual fracked well. "The real risk comes from the disposal process, where (companies) have to truck it to a new site or pipeline it to a new site," Goss said Tuesday. "If we do have a spill, what are the concerns they have to worry about?" His paper notes that Alberta has experienced more than 2,500 such spills between 2011 and 2014. 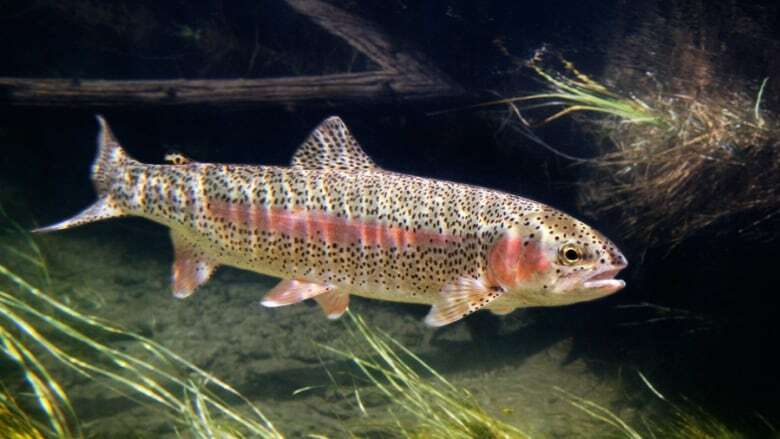 The researchers exposed rainbow trout to "sub-lethal" levels of such fluids. The levels were intended to simulate exposure fish or other organisms would be subject to from a pipeline leak or a spill near a water body. Even at dilutions as low as 2.5 per cent — 2.5 litres of process water to 100 litres of fresh water — fish showed significant impact on their livers and gills. Goss calls the effect "oxidative stress." That means chemicals in the water force liver and gill cells to age and die more quickly. "Oxidative stress is associated with damage to membranes," he said. Some chemicals in the water, which have been shown to cause hormone disruptions in other studies, were absorbed by the fish. "There are endocrine-disrupting effects potentially involved in some of the chemicals involved in that," Goss said. "There's the potential that some of the fluids may be similar in the effects that you would see from municipal waste water, where you might see feminization of animals." The effects were amplified by the presence of sediment in the water. Goss said that could mean that organisms on lake bottoms or riverbeds could be more at risk than fish. Filtering sediments out might be a way for industry to reduce the toxicity of its process water before it gets transported, he suggested. The study points out that its tests were conducted on water from one specific well operated by Encana (TSX:ECA). The precise composition of fracking fluids varies from company to company — and even from well to well — and is a closely guarded commercial secret. Goss said fluids used in the tests were common enough for the results to be widely applicable. The next step, he said, is to figure out exactly how the chemicals damage livers and gills, as well as to further examine how they disrupt the endocrine system.